Author, historian and broadcaster Tom Holland launches new campaign leaflet. Our new campaign leaflet is now in circulation. 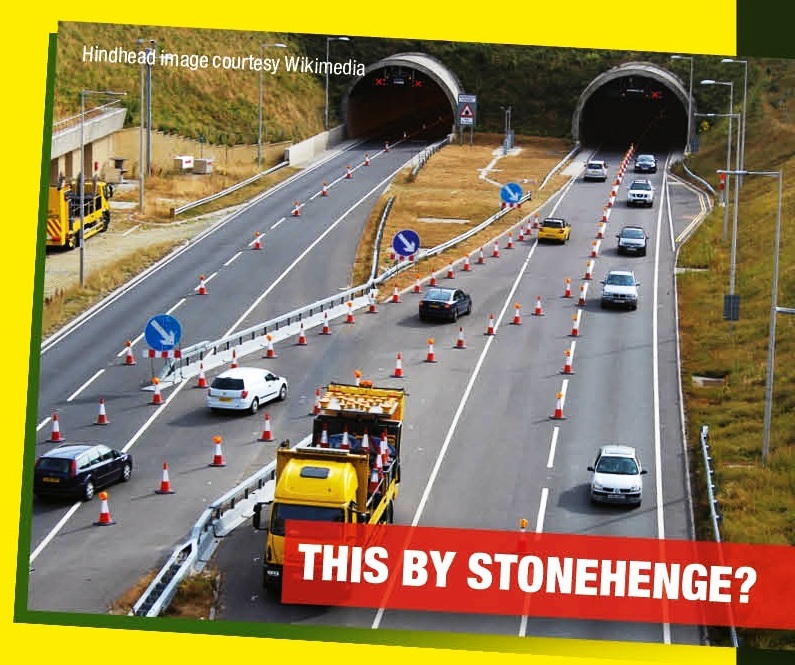 Designed professionally, it is eye-catching and delivers the clear message that the Stonehenge World Heritage Site (WHS) is still under threat from major road building, including construction of a short twin-bored tunnel. A map of the WHS shows its boundaries, main roads, modern boundary settlements and principal known archaeological monuments. The scales below the map compare the width of the WHS with the length of a 1.8 mile (2.9km) tunnel, demonstrating that wherever the tunnel might be placed, twin portals would be located well short of the WHS boundary. An image of tunnel portals at Hindhead provides an example of the visual and physical impacts of such features. 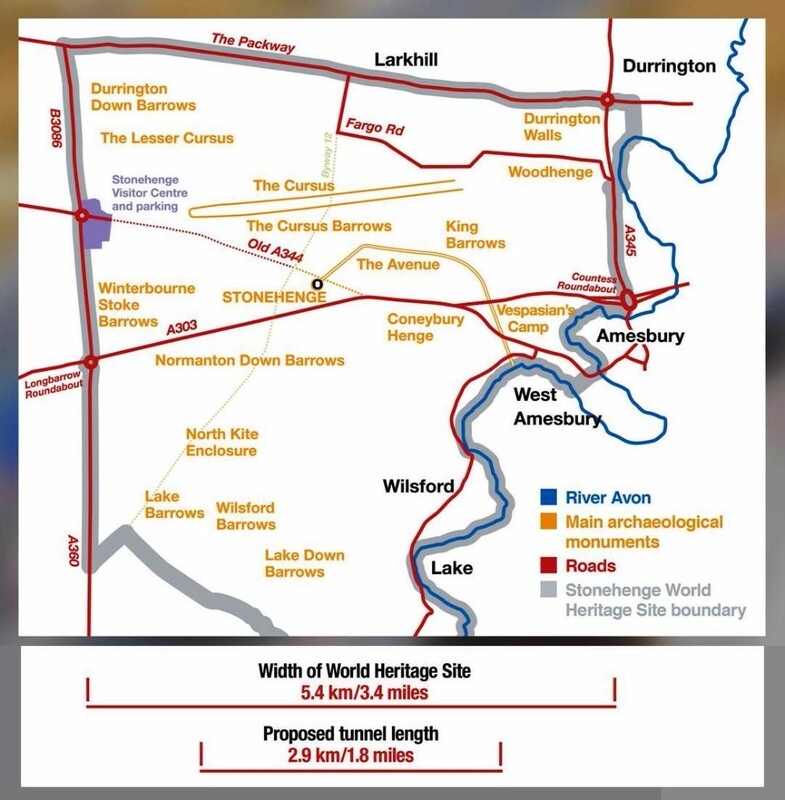 At Stonehenge, the deep tunnel cuttings, along with lighting and street furniture, new dual carriageway, and grade separated junctions on the WHS boundaries would be hugely damaging and – in our view – unacceptable in what UNESCO has designated as a “landscape without parallel” for its Neolithic and Bronze Age archaeology. Despite assertions that the road tunnel announced by the Government in December 2014 will be “at least 1.8 miles (2.9km) long”, so far the UK Government has not revised the tunnel length and road dualling for which funding was allocated. It’s agent, Highways England, refers to the 1.8 mile tunnel as its “working assumption”. This brings seriously into question the options and process for consultation on A303 road widening programmed for early 2017. Meanwhile, archaeological evaluation trenches have been dug within the WHS, presumably in the hope of finding an optimum route for a tunnel. One such group of trenches was dug on the line of the midwinter solstice from Stonehenge. Evaluation trenches elsewhere have encountered prehistoric archaeology. Government has an obligation under the World Heritage Convention to protect the WHS but in further damaging the site with such a road scheme it would seriously fail in that duty and run the risk of the site being removed from the World Heritage List. We are continually learning more about the interconnectedness over time of the landscape and the monuments and sites within it. Geophysical surveys during the last few decades reveal that the WHS is rich in archaeological sites, many of which have not yet been investigated and are prehistoric in origin. Stonehenge is about so much more than Stonehenge. Please don’t let the Government desecrate our most significant prehistoric landscape. We hope that you will sign our petition and tell your friends and colleagues about it. 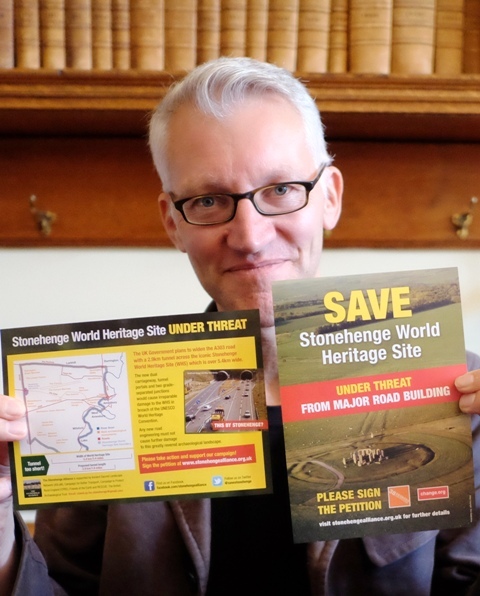 To order copies of the campaign leaflet please email stand.up.for.stonehenge@gmail.com with your name, address and post code indicating the quantity you might be able to distribute.